The 2015 - 2nd Annual Invasive Plant Challenge is here!! Challenge contestants compete in the First Annual Invasive Plants identification game. In July 2014, the Fremont Conservation District, 4 agency partners and local businesses held the 1st Annual Invasive Plant Challenge in Fremont County!! The challenge was to identify invasive species of weeds and plants in a given location and to write up a comprehensive plan on how to eradicate these plants. There were 21 local and state competitors who took on this challenge!! 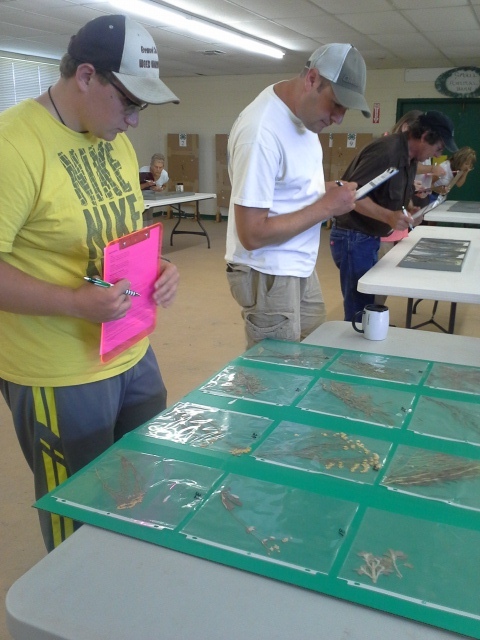 The competitors were first tasked to complete a weed identification game. Then they were taken by bus to the Blue Heron Recreation Area to identify the invasive weeds in a real world setting. Here they were tested to come up with a plan for eradication. .
Over $1000 in cash and $300 in prizes were given to the winners! If you are interested in competing in the next upcoming challenge, please contact us at 719-275-4465 extension 101! After the challenge was over, J.R. Phillips of the Fremont County Weed Board made a presentation to local landowners on the various weeds and how to eradicate them. This event was well received by the local and state competitors and landowners - the invasive species of weeds and plants in Fremont County don't stand a chance!! 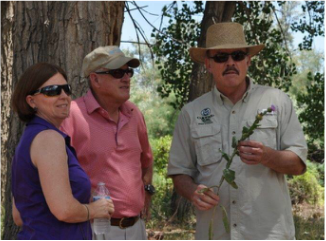 Expert judges Dr. Sandra McDonald, Larry Walker (Chaffee County Weed Director), and Dr. Scott Nissen (CSU Ft. Collins) discuss List A/B invasive species.